The City of Delta is the county seat and the most populous city of Delta County, Colorado, United States. The population was 8,915 at the 2010 census. The United States Forest Service headquarters of the Grand Mesa, Gunnison, and Uncompahgre National Forests are located in Delta. Delta was built as a trading post for the Ute tribe and early settlers. Fort Uncompahgre was built in 1828. 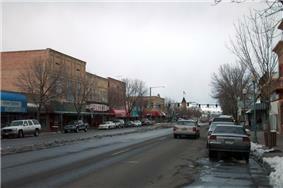 The town was named because of its location on the delta, where the Gunnison River and the Uncompahgre River intersect. The town was incorporated in 1882. Delta is located at (38.740879, -108.063423). According to the United States Census Bureau, the city has a total area of 5.5 square miles (14 km2), of which, 5.3 square miles (14 km2) of it is land and 0.2 square miles (0.52 km2) of it (3.62%) is water. Delta is considered part of the Western Slope of Colorado. In the city the population was spread out with 26.7% under the age of 18, 8.2% from 18 to 24, 23.2% from 25 to 44, 24.5% from 45 to 64, and 17.5% who were 65 years of age or older. The median age was 38.0 years. For every 100 females there were 93.8 males. For every 100 females age 18 and over, there were 91.0 males. ^ "A History & Heritage Hotbed". Delta County Colorado Tourism. Retrieved 2012-09-07. ^ "Profile for Delta, Colorado, CO". ePodunk. Retrieved 2012-09-07. ^ "Delta, Colorado". City-Data.com. Retrieved 2012-09-07. ^ "Step back in time…". About Delta Colorado. Retrieved 2012-07-07. U.S. Highway 50 runs east-west, crossing 12 states. It links Sacramento, California with Ocean City, Maryland. In Colorado, it connects Delta to Montrose, Grand Junction and Pueblo. State Highway 65 is a 61-mile stretch that runs from State Highway 92 in Delta to Interstate 70 near Palisade. State Highway 92 begins in Delta, at the intersection of Main Street and First Street. It runs 73 miles to the east, reaching US 50 near Blue Mesa Reservoir and Curecanti National Recreation Area. Montrose Regional Airport, located 21 miles south of Delta, is the closest airport served by scheduled airlines. 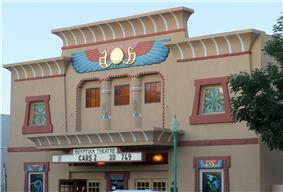 In Grand Junction, which is 39 miles to the north, there are also scheduled airline services, as well as an Amtrak train station with a daily California Zephyr departure on each direction. The principal newspaper is the Delta County Independent, which is published weekly on Wednesdays. Local readers also enjoy The High Country Shopper, a free “shopper” paper that distributes over 15,000 copies throughout the county.